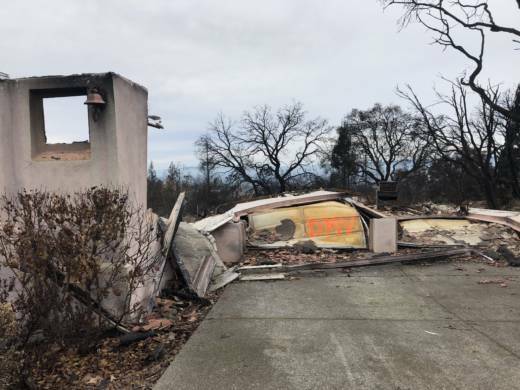 The Governor’s Office of Emergency Services sent a scathing letter to the U.S. Army Corps of Engineers this week, detailing extensive damage done to homeowners' properties by Army Corps' contractors during the North Bay wildfire cleanup effort. It charges the Army Corps with failing to properly oversee the cleanup, failing to communicate with the state and failing to remedy damage to homeowners' property. "Due to this egregious oversight, USACE's contractors caused substantial damage to many survivors' properties resulting in re-victimization of the affected wildfire survivors,” reads the letter from Cal OES Director Mark Ghilarducci to the Army Corps' South Pacific Division Commander Col. Kimberly Colloton. Army Corps operations for the $1.3 billion project concluded in June. But, as KQED reported earlier, many homeowners had outstanding issues with the project from over-excavated lots to damaged septic systems. In recent months, Cal OES hired contractors and consultants to backfill some over-excavated lots and to assess and repair damaged properties. Mike Peterson, Chief of Public Affairs for the Army Corps' South Pacific Division, said Colloton would need to coordinate with FEMA before responding formally to Ghilarducci's letter. Peterson said while he understands that some homeowners have outstanding issues, the size and scope of the cleanup project was massive, and that Army Corps' personnel worked 12-hour days, seven days a week to complete the removal of 1.7 million tons of debris from Sonoma, Lake, Mendocino and Napa Counties. "We're looking at houses being rebuilt right now," Peterson said. "So we're seeing mission accomplished." Peterson also said that this was the first time the Army Corps had done a wildfire debris removal job, and that it learned lessons along the way. In the letter, Ghilarducci called on the Army Corps to re-engage with the state to fix some of the costly issues that remain for homeowners. He wrote the state has already spent millions of dollars on repair. Peterson said the Corps wishes to resolve issues that are within its authority to fix. "But understand," he added, "our missions and our resources to address those missions in a disaster come from FEMA." The Stafford Act indemnifies the federal government from all claims arising from damage done during disaster debris removal projects. FEMA did not immediately respond to KQED's request for comment. The letter also said that the Army Corps failed to provide Cal OES with key documents that would have helped the state respond to hundreds of complaints from wildfire survivors. Peterson said the cleanup project was completed in cooperation with Cal OES, and that communication was ongoing. "I guarantee you they've got our phone number," he said. The Governor’s Office of Emergency Services spokesman Brad Alexander said that his office did not wish to comment. "The letter speaks for itself," Alexander said.